world wide directory of manufacturers, suppliers, service providers of metal parts finishing machines & consumables such as : Abrasive blasting machines, Blast cleaning machines, Airless, Airblasting, Shot blasting, Sand blasting, Vibratory finishing, Mass finishing, thermal deburring, Dry ice blast cleaning, Electro chemical deburring, Polishing, Buffing, Finishing, Deburring as well latest in metal finishing etc. शॉट ब्लासटिंग मशीन्स के निर्माता गुरु नानक मॅन्यूफॅक्चरिंग कंपनी, जालंधर. हर तरह की शॉट ब्लासटिंग मशीन्स के लिए हमे अभी फोन करें. अगर आप कोई भी ट्राइयल करना चाहते हैं तो हमें फोन करें. 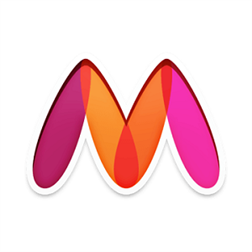 अगर आपको कोई भी डीटेल चाहिए, मशीन देखना चाहते हैं तो हमे फोन करें. अगर आप ढलाई, फॉर्जिंग या फिर डाई कास्टिंग के निर्माता हैं तो आपको शॉट ब्लासटिंग मशीन की आवश्यकता भी होगी. हमारे पास सभी तरह की शॉट ब्लासटिंग और ग्रिट ब्लासटिंग मशीन्स बनती हैं. टम ब्लास्ट, टेबल, हॅंगर और कंटिन्युवस कनवेयर मॉडेल्स उपलब्ध हैं. किसी भी जानकारी के लिए बेहिचक फोन करें. Vohras International : Exporters of Shot Blasting Machines for Finishing of Castings, Forgings, Aluminium & Zinc Die Castings, Brass & Gun metal parts, Sheet metal & Tempered components. Please log on to our Website www.finishingmachines.com for more details and feel free to mail us your valued query for our best offer. Shot blasting machines for Aluminium die castings, Brass & Gun metal parts are available in various models such as Tumblast, Table, Hanger & Continuous conveyor models. In Tumblast, a conveyor belt rotates inwards, inside the chamber of the shot blasting machine & the components are loaded on it as per the size & capacity of the machine. The door is than closed. Rotor is switched on for throwing Shots or Grits on the components. By this process, the loaded components get a universal finish. Abrasive medias such as Shots or Grits are continuously fed by the elevator of abrasive media. All the dust extracted in the process goes to the attached dust collector. On completion of desired time period, the door is opened & than the conveyor belt is driven outwards. As a result the components can be removed from the chamber. An automatic loading system can also be attached to the shot / grit blasting machine. The Tumblast shot blasting machines are available in many sizes, right from a 2 cu ft capacity machine to a 15 & 20 cu ft capacity machines. Some of the sizes are: 20" x 27", 20" x 42", 27" x 36", 30" x 43", 36" x 42", 42" x 42" as well 48" x 48". Swing table model shot blasting machines are suitable for bigger or heavier components or if the smaller parts are to be shot blasted only one side. Many sizes are available from a minimum 36" of table to 120" of table in sngle as well double doors. 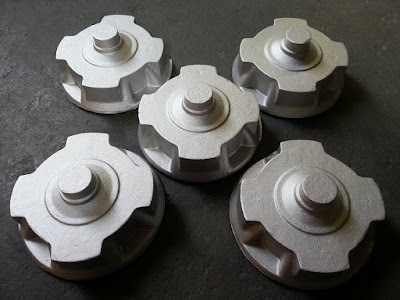 The spare parts for shot blasting machines, mostly wearable are made from ni hard or alloy steel to get the maximum life.The main spare parts include the Rotor, Blades, Spring locks, Cage & Impeller, Cage adapter, centre plate, Top segment, Side liners, Round plates as well the conveyor belt. Few precautions are necessary while running the machine. Metal components must be Deburred, Cleaned & Finished, before affixing them into any of the bigger mechanism. These metal components may be the sand castings, forgings, aluminium die castings, zinc die castings, brass & gun metal parts, sheet metal or tempered components. In the earlier days, people used the Tumbling barrels, loaded with leather particles ( even now being used at many places ) for cleaning & finishing of metal parts. Later the Vibratory finishing machines, Centrifugal finishing machines, Drag finishing machines as well the Roll Flow finishing machines came into operation. Various types of ceramic stones, plastic stones, stainless steel media, walnut shells, glass beads are used in this type of machines for deburring & polishing of metal components. Similarly, Rotary barrel shot blasting machines came into existence in the earlier days for abrasive blasting on metal parts for cleaning & finishing. Later the horizontal model of Shot Blasting machines came into action such as Tumblast shot blasting, Table shot blasting, Hanger shot blasting & the continuous conveyor shot blasting machines. These machines have a centrifugal blasting rotor that rotates mechanically, whie throwing steel balls, normally called shots or grits, on the components for the finishing. Sand blasting machines are also available in portable models as well the cabinet models. The cabinet model of sand blasting machines include various models such as pressure blasting, suction blasting as well the wet blasting machines. These machines can be used to clean & finish any specific area of a metal component also. Sand blasting nozzles of boron carbide & tungsten carbide are used in these machines & these are operated by the air pressure provided by a compressor. Sand blasting as well glass etching is also being done now a days on glass, by using these sand blasting machines. Various types of abrasive medias such as aluminium oxide, glass beads, river sand, shots, grits, plastic abrasive, garnet etc can be used in these machines. The latest in surface finishing machines include the Thermal deburring machines, Electro chemical deburring machines, Dry ice blast cleaning machines, Micro sand blasting machines & a lot more. More details can be viewed in the Directory of Finishing machines which offers a wide range of machines as above. Finishing of Brass components ! Since last over 25 years we get repeated & regular calls from our old & new would be clients for the finishing of metal parts. It may be castings, forgings, aluminium die castings, zinc die castings, brass components, gun metal parts, tempered components or the sheet metal parts. I remember a customer who visited me from Agra, almost 10 years ago, for the Finishing of brass hinges. He brought few samples with him. Moreover he could not tell me about the type of finish he required. He just asked for a better finish. Though i could easily offer different type of finishes by using either a vibratory finishing machine OR a suction blasting machine i.e. sand blasting machine with a suction blasting gun as well a wet blaster. But i knew he had the bulk of material & a single machine won't be enough for him to meet the targets. So i took him to my works for a trial on our Airless Shot Blasting machine for Aluminium & Brass i.e. Tumblast model. We did a bit of adjustments in the machine and changed the abrasive media to a desired size & quality & asked the client to come inside the workshop. His samples were loaded in the machine & we did the shot blasting for few minutes. The minute we opened the door of the machine, our client looked more than happy. Amazing results were clearly visible on the Brass Hinge as well on the face of the client. He immediately placed the order with us & took the delivery as desired. 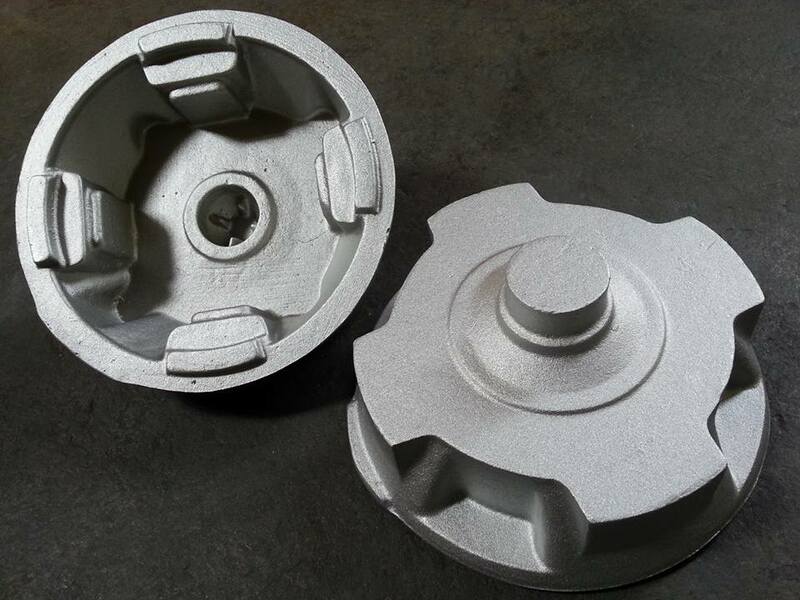 Friends, if you have any such component, that may be castings, forgings, aluminium die castings, zinc die castings, brass components, gun metal parts, tempered components or the sheet metal parts, for which you are looking for a better finish, just call us, just come to us. We have a wide range of latest machines for Deburring, Polishing & Finishing of all types of metal components.